Complete your gaming setup in styleExperience a true gaming setup with the AKRacing Core Series EX Gaming Chair in BLACK/RED & the AKRacing Summit Gaming Desk. This exceptional gaming bundle consists of a comfortable reclining chair with extra cushions for neck and back support and a large curved edge gaming desk, with a top portion that measures nearly 4 feet wide and 3 feet deep to support multiple monitor setups, keyboards, mice, and any other accessories. Game in style with sleek carbon fiber looks of the desk and matching AKRacing gaming chair, with adjustable features for your comfort. The AKRacing Summit Gaming Desk is built for gamers looking for a sturdy and stylish addition to the games room or office. Built with a gauge steel frame and a textured MDF PVC laminated surface that measures 116cm wide and 73cm deep, included is a extra large AKRacing grey mousepad ensuring a long-lasting grip for your monitors and accessories to comfortably sit on. This large desk features a built-in cable management system, curved edge design for comfortable viewing so you can get closer to the action. 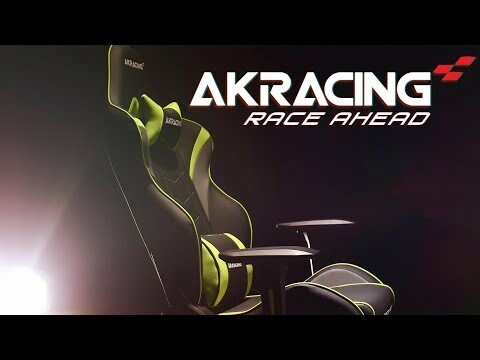 Sit back and recline up to 180 degrees with the AKRacing EX Gaming chair, built to last with a metal frame, cold-cured foam padding, adjustable armrests and rocking function. The Core Series EX in BLACK/RED is designed with breathable fabric upholstery front and back, for a comfortable cool feel and includes a pair of adjustable cushions providing extra neck and lumbar support, which improves your posture whilst seated.